Yes, another update to Vignettr is out! v1.3. 1) Noir: A high contrast monochrome output, much like the Nior style films. 2) Semi-Desat: A med contrast partial desaturation of the image, with a bit of vignette and ND grad filter applied for good measure. 3) Vegetable Lasagne: A warming, partially vintage tone. 4) Yesterday: A low contrast, light orange tinting to give a look much like film camera’s of the 70’s. With all of these presets, once they have been applied that does not stop from you from tweaking each of the usual adjustments (vignette, luminance etc). The other change is to the user interface… nothing drastic, but some improvements I feel make the app easier to use and more pleasing to the eye. Credit to Patrick Hoesly on flickr for the use of one of his many amazing textures as the backdrop in both the iPhone and iPad versions of Vignettr. on ios 7 and ip5, vignettr crash most of the time. an update is needed. 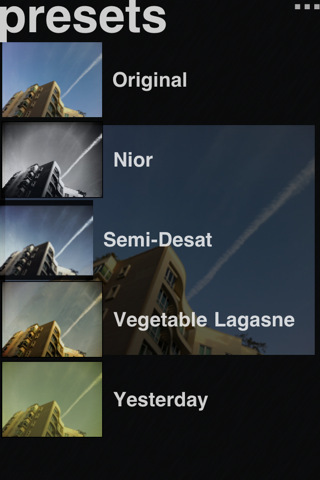 btw, can you add the possibility to change the vignette position (all around the picture)? should be very good for spot light and black all around.